The Siding & Trim Company Of Michigan - Home Improvement Blog | The Siding and Trim Co. Same Sad Story... or Spruce Up Spring with Spectacular New Siding and Trim! It’s arrived! After another hard, long, cold winter, spring is here! The sun is out, soon the trees and grass will be bright green, and finally the gorgeous colors and hues of the multitude of flowers will appear. Everything will be bright and beautiful – revitalized by the gentle spring rains. Except, that is, the exterior of your house. It’s the same, sad story. The cold, hard snow and ice of winter did nothing to improve its condition since last fall. The peeling of the paint that had started last summer has definitely not improved over the winter. Instead, it’s worse. Much, much worse. Was it only a couple of years ago that you went through the process of hauling out ladders, grabbing the brushes, and picking out buckets of paint? As you look around, you see most of your neighbors spending the warm, sunny days of spring playing while you’ll be spending it painting. Again. Or not? Why not spruce up your house this spring by contacting The Siding and Trim Co. and having them install spectacular new Siding and Trim? Let them spend the bright, warm, sunny days working when all you have to do is pick out one of the multitude of gorgeous colors. Then, for many years to come, when spring comes around, the exterior of your house will look as bright and beautiful as it did the summer and fall before! And best of all, you’ll be able to join your neighbors and enjoy the wonderful days of spring by playing, not painting! How You Know When To Replace Your Siding? 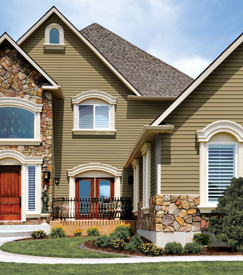 Vinyl siding is exposed to all of nature's elements - sun, wind, snow, and rain. The fibers that hold your vinyl siding together will break down over time. Vinyl siding can usually hold up 15-20 years, but the age of your siding is something to keep in mind so you don't get caught off guard. Wind can be the most dangerous threat to your siding, as it can get under a sheet of siding and bend it or even tear it from the wall. During the cold Michigan winters, vinyl siding can contract and crack causing you to need to replace sections or all of your siding. Sometimes all a house might need is a little face-lift, and siding can provide that aesthetic difference to the appearance of your house. In comparison to many other house projects, new siding can prove to be the relatively inexpensive change that your home needs! Welcome to The Siding & Trim Company! Please check back periodically for our announcements and information on Siding and Trim. The Siding and Trim Co. Copyright of The Siding and Trim Company 2012 - 2013. All Rights Reserved.